As you know, Hurricane Irene is headed up the East Coast and straight for the Philadelphia area. 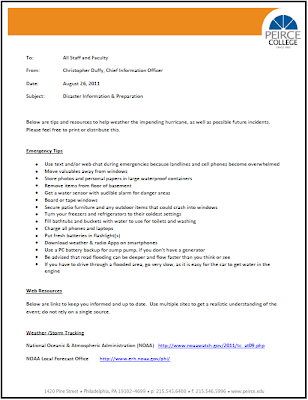 Please review the following emergency checklist and share with fellow faculty, staff, students, friends, and family. We will keep you updated on any cancellations or closings through our main phone lines and student portal. If we experience severe disruption to our Web servers, we will publish information on Peirce's Facebook page. Stay safe this weekend!